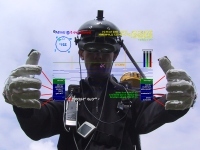 This page describes our latest generation of mobile outdoor augmented reality systems. Since 1998, we have designed a wide range of systems which have evolved over time as equipment and technology has improved. 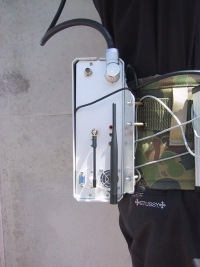 Our 2006 model was the most portable and powerful system in the world at that time! 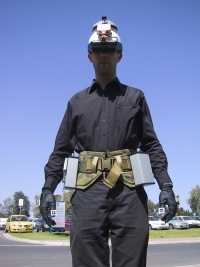 The new Tinmith 2006 system is a combination of hardware in the form of a small belt-worn computer, a specially designed helmet with head-mounted display, wireless input devices, and software to perform augmented reality. This system was developed in the WCL by Wayne Piekarski, Ross Smith, and Ben Avery. This page contains information about the various hardware components in our current 2006 system, as well as some pictures of our old systems for historical purposes. Here are some videos that show a user standing outdoors wearing the system. Note that videos of the system in action from the view of the user in the HMD are available from the demos page. This is the Tinmith backpack 2006. As you can see from the images of our previous systems below, the new version is lighter and more robust than ever! We have taken our eight years of experience in the field and built a system using the best components that are currently available. We have designed our own custom housing to make the system robust and ready for use in outdoor conditions. The whole system weighs 4 kilograms! 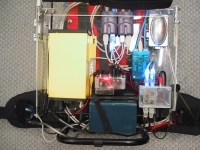 Battery packs are an additional weight of approximately 2-4 kg depending on operating time and battery technology used. The profile of the system is almost to the point where a large jacket could be worn over the top and conceal the system. 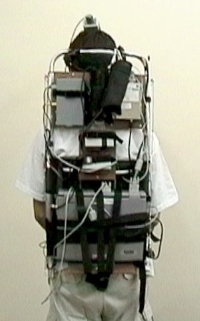 Compare this to the weight of previous systems which was over 12 kg on a hiking frame and with less functionality! The following photos show the left side (with ventilation fan and power switch), and right side (with antennas and helmet connector). The following images show the system from the front and rear with the whole user visible. Note the lack of complex cables and the small size of the unit. The batteries on the front are hot-swappable during operation, and we use two 8000 mAh Ni-MH batteries for 3 hours of operation. The entire system can automatically start doing AR in 70 seconds from the power switch being turned on. The system contains a custom modified Pentium-M 2.0 GHz computer with Nvidia GeForce 6600 graphics. The processor is designed for mobile applications, and the graphics processor is capable of handing any complex rendering task with ease. 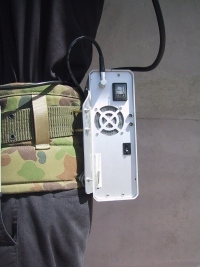 We use sub-50 cm accurate GPS receivers to provide excellent position tracking outdoors. The system also implements 802.11 for wireless networking, Bluetooth for wireless peripherals, wireless video output, and USB and VGA ports for debugging. For the future we have a new design that will be about half the thickness, with the other dimensions being roughly the same, and a small reduction in weight. This design will be at roughly the limit of what is possible with current technology. Note that the size of the battery packs can be varied depending on the application requirements. The new Tinmith helmet is a single integrated unit which has a single cable connecting it to the backpack. The cable is flexible and reinforced to make breaking it difficult, and industry-standard Lemo connectors are used for a robust connection. Other AR systems typically use multiple cables with fragile PC connectors that easily break. 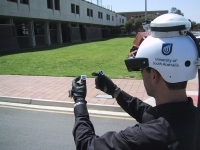 The helmet contains a survey-grade GPS antenna, Point Gray firewire video camera, head mounted display, headphones, and an InterSense orientation sensor. We have a new helmet design under consideration at the moment which will use less components and be more robust. 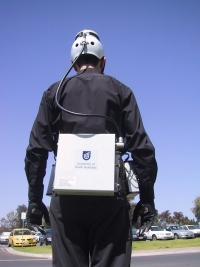 We can integrate electronics into any kind of helmet, such as a hard-hat or kevlar helmet if required. 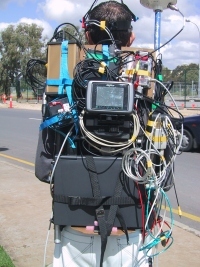 The new backpack uses Bluetooth and 802.11 wireless technology for all external communication. Therefore there are no wires for any of the external devices, making the system much easier to wear and more reliable. Our applications typically use a set of gloves as the primary input device, and we have redesigned new wireless gloves. These gloves use Bluetooth and have wiring which is sewn into the gloves, so there are no external wires. Our glove design is very flexible, and can replace other devices such as FakeSpace PinchGloves. Contact us if you would like to enquire about using these gloves in your systems. We also have other input devices for situations when gloves are not appropriate. We have a Bluetooth input box which has push buttons on it, as well as a plastic gun which is used for games such as the ARQuake game. Any number of types of devices can be easily integrated over wireless. The Tinmith backpack 2004 was our last design based on frames worn on the user's back. A polycarbonate box is used to mount all the necessary components, which makes the design easy to change, but also makes things much larger. While the system weighed approximately 12 kg, it was quite comfortable due to the harness used. 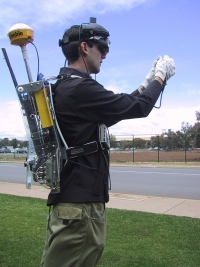 Note the location of the GPS antenna, which is mounted to the backpack and not the helmet. This system was custom designed in the WCL by Wayne Piekarski and Ross Smith. By committing to certain components and limiting the flexibility of the design, the overall size and weight are greatly reduced. The polycarbonate box provides protection for the devices as well as a flat mounting surface. A baby carrying harness permits easy wearing of the backpack with little extra weight added. Plastic Velcro is used to permit simple reconfiguration of devices and provides a cable routing infrastructure. USB is embedded into devices to remove the need for legacy interfaces, and provides a compact power and data distribution mechanism. The following image shows the components used internally, including Trimble Ag132 GPS, USB hubs, VGA-TV converter, power supply, glove controller, 8000 mAh Ni-MH battery, USB-serial converter, and various interface cables. 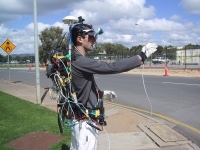 Note that the helmet was connected via separate cables for the HMD, firewire, and orientation sensor. 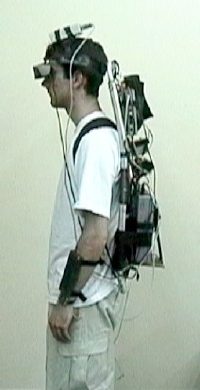 A modified version of Tinmith backpack 2004 was used to support a field programmable gate array and chroma key device for a prototype hand tracker we were testing at the time. 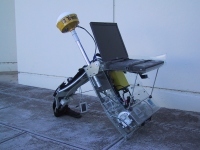 The flexible backpack design made these additions quite easy to perform. Click here for a copy of our ISMAR poster on a single A4 sheet, and here for the two pages in the conference proceedings. Paper AUIC05 Smith, R., Piekarski, W., and Wigley, G. Hand Tracking For Low Powered Mobile AR User Interfaces. In 6th Australasian User Interface Conference, Newcastle, NSW, Jan 2005. Poster ISMAR04 Piekarski, W., Smith, R., and Thomas, B. H. Designing Backpacks for High Fidelity Mobile Outdoor Augmented Reality. In 3rd Int'l Symposium on Mixed and Augmented Reality, Arlington, Va, Oct 2004. 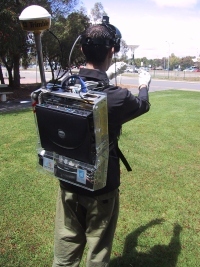 The Tinmith-Endeavour backpack is designed to support research into outdoor augmented reality. 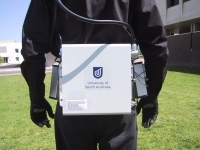 It was developed by a team from both the Wearable Computer Lab and the Defence Science Technology Organisation, based on the previous Tinmith backpack designs. It was mainly used from 2001 - 2003. 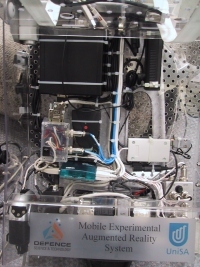 A team of engineers from DSTO worked with me to construct a polycarbonate box, which was mounted to a breathing-tank harness for the user to wear. The main design criteria were to make a system which was flexible and able to support changes very easily. This made the system large and heavy but it allowed us to do our research more effectively than the previous system. A nice feature of the system was that it could be folded open and used like a table during debugging sessions. The below image also shows some of the internal layout of the components and their cables. 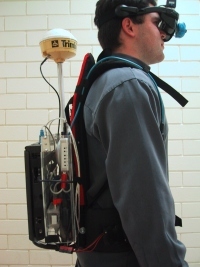 Wayne Piekarski's PhD thesis contains a complete and detailed review of all Tinmith backpack systems up to 2004. 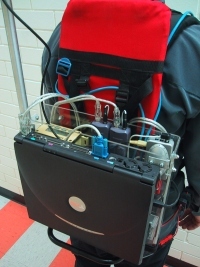 Click here to read the appendix on backpack systems.